Over the last couple of weeks, we’ve looked at letters of the alphabet that didn’t quite make the cut. Some of the these letters were added to the alphabet and later dropped. Others were proposed additions that never got adopted. Some spelling reformers, however, have not been content to add a new letter here or there. Over the years, a string of famous and not-so-famous linguists have proposed throwing out the Latin Alphabet altogether. Let’s look at some of the more notable attempts to create an entirely new alphabet. After being chased out of several states for their beliefs, the Mormons settled in what’s now Utah. There they tried to establish a utopian society known as Deseret. As they settled down in Salt Lake City, Mormon leader Brigham Young commissioned the regents of the University of Utah to create a new writing system for English. What they came up with was an entirely new alphabet. But just like so many other spelling reforms, the Deseret Alphabet failed to catch on. Maybe the Deseret Alphabet was just ahead of its time, however. It would be great for texting. The letters were designed to be used as words. Just as teenagers type the letter “u” for “you”, Deseret writing lets you substitute the letter Bee for “be” or the letter Thee for “thee”. This new alphabet seems like it would be pretty useful to a generation of people typing on little touch screens. George Bernard Shaw was a famous Irish playwright whose most famous play, Pygmalion, became the movie My Fair Lady. And while Shaw was most famous as a writer, he was also a renowned activist who push for change in many different fields. In his will, Shaw commissioned a new writing system for the English language. He wanted an entirely new alphabet so that the reformed words didn’t look like simple misspellings. Also, by creating new letters, the creators of the new alphabet could make similar sounds look like similar characters, a feature of Korean Hangul writing. Of all the systems to replace the Latin alphabet but entirely new letter forms, the Shavian Alphabet is probably the most successful. However, it’s probably not the most well-known. That distinction would fall unto fictional alphabets. Some alternate writing systems were never meant to be taken as serious replacements for the Latin alphabet, though they could be used that way. When it comes to inventing new scripts, one of the most prolific linguists was J.R.R. Tolkien. 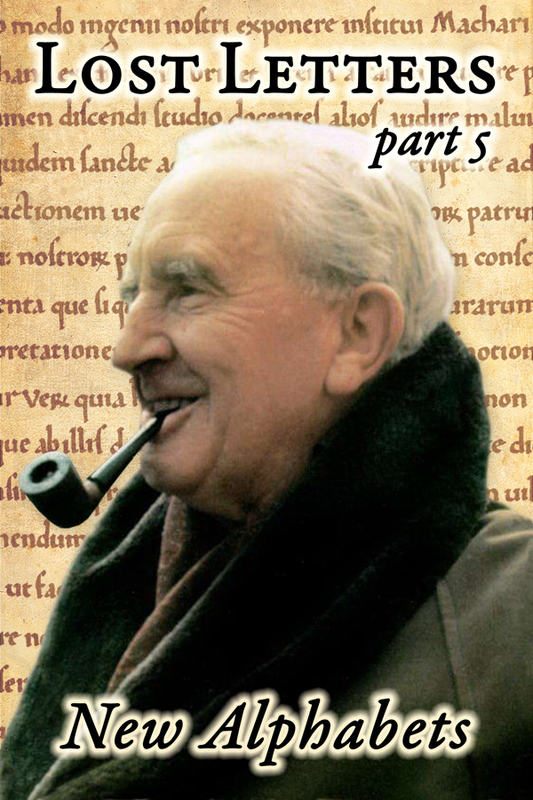 He invented several alphabets for his world of Middle Earth. Though Tolkien created these new alphabets for the fictional languages of Middle Earth, he occasionally used them to write English as well. Of these scripts, the most well known is Tengwar, which is the script you most often see in the movies and book covers. Like the Shavian Alphabet, Tengwar has similar symbols for similar sounds, though I think it looks better aesthetically. In fact, as a graphic design geek, I think Tengwar is the prettiest script ever developed, either real or imagined. Other sci-fi and fiction franchises have their own alphabets, though none are as well-done as Tolkien’s. Take the Klingon language from Star Trek. As a spoken language, it has a small but ardent following. The writing system is a little messier. In the Star Trek movies, set designers created spiky nonsense characters to represent the language. These were later retrofitted to the written language, though most Klingon speakers just use the Latin alphabet. Then there’s Star Wars. In the first film, the movie simply used Latin letters and Arabic numerals. But since George Lucas is (in)famous for going back and changing things, the 2004 re-release featured a script called Aurebesh. This is basically just the English language made to look alien, though it does feature a few extra letters for English digraphs like “sh” and “th”. Otherwise this alphabet retains all of the disadvantages of the modern English alphabet, making it a poor choice for a replacement script. This is the final installment of the Lost Letters series, at least for now. Who knows? Maybe I’ll think of some more interesting things to write about. If you have any ideas, let me know in the comment section.